Teacher education programs are charged by administrators, legislative bodies, parents, and others to produce new teachers who are “classroom ready” upon graduation. Many interns and teacher candidates, however, come to their programs with very different levels of preparation and skills in dealing with children. Rather than using a one-size-fits-all approach, teacher educators should differentiate fieldwork and practicum experiences to better meet candidates' varying readiness levels, interests, and learning profiles to create placements that fit the interns' needs and skills. Differentiating the fieldwork and practicum experiences of interns has the dual benefit of increasing retention rates of teacher education programs and better preparing new teachers for their first classrooms. Suggestions are made regarding ways teacher educators can differentiate placements for interns and teacher candidates. After a period when teacher education programs were producing too many graduates for the available jobs, a teacher shortage is looming in many parts of the United States. Concurrent with this shortage are mandates that new teachers be “classroom ready” as they take control of their first classroom (Allsopp, DeMarie, Alvarez-McHatton, & Doone, 2006; Darling-Hammond, 2013). These conflicting forces pose a conundrum to many teacher preparation programs (Bartow, 2015; Darling-Hammond & Bransford, 2005). On the one hand, teacher candidates, their parents, and schools that accept interns want a teacher preparation path that is concise, efficient, and organized in such a way that it can be completed in four years with some predictability regarding the work required of each participant. On the other hand, policy makers, parents of school children, and school administrators want new teachers who are fully able to perform the duties expected of them in a competent and proficient manner. A solution to this problem is often considered difficult, as it is challenging to craft a program that competently takes care of both of these concerns. Happily, ways to assure that teacher education programs are both efficient and effective are readily at hand for most institutions. Growing understanding of differentiated instruction suggests that while embracing common goals and objectives for all learners is equitable and appropriate, mandating the same experiences for all is inefficient and counterproductive (Darling-Hammond, 2013; Tomlinson, 2001; Wolfe, 2001). Some teacher candidates enter their programs with years of time spent as camp counselors, paraprofessionals, or engaged in other experiences working with children. Often these learners proceed quickly and effectively through their fieldwork and practicum experiences, as their prior work has left them effective as classroom managers and knowledgeable about the practices of schools (Campbell & Dunleavy, 2016). Other teacher candidates, however, enter their pathway to becoming a licensed practitioner with few exposures to working with children, and indeed with little if any work experience. These candidates will often require more scaffolding, exposure, and practice before they are ready to take over a classroom on their own (Capraro, Capraro, & Helfeldt, 2010; Washburn-Moses, Noltemeyer, & Schmitz, 2015). This chapter examines how teacher education programs can monitor the skills and needs of their candidates and match these to fieldwork and practicum experiences. 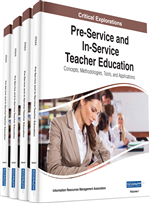 Each section concludes with an Implications for Practice section that provide practical suggestions to help teacher education programs to meet the dual needs of efficiency and excellence.